For the jazz musician, see David Jones (jazz musician). For other uses, see Davy Jones. Davy Jones in Sydney, 1968. David Thomas "Davy" Jones (30 December 1945 – 29 February 2012) was an English singer-songwriter, musician, actor and businessman best known as a member of the band The Monkees, and for starring in the TV series of the same name. His acting credits include a Tony-nominated role as the Artful Dodger in the original London and Broadway productions of Oliver! as well as a starring cameo role in a hallmark episode of The Brady Bunch television show and later reprised parody film; Love, American Style; and My Two Dads. Jones is considered one of the great teen idols. David Thomas Jones was born at 20 Leamington Street, Openshaw, Manchester, Lancashire, England, on 30 December 1945. His television acting debut was on the British television soap opera Coronation Street. He portrayed Colin Lomax, Ena Sharples' grandson, for one episode on 6 March 1961. He also appeared in the BBC police series Z-Cars. After the death of his mother from emphysema when he was 14 years old, Jones rejected acting in favour of a career as a jockey, apprenticing with Newmarket trainer Basil Foster. He dropped out of secondary school to begin his career in that field. This career was short-lived, however. Even though Foster believed Jones would be successful as a jockey, he encouraged his young protégé to take a role as the Artful Dodger a production of Oliver! in London's West End, a move which changed Jones' life forever. In turn, Jones cared for Foster in his later years, bringing him to the United States and providing him financial support. Jones in a 1965 ad for his Colpix single "What Are We Going to Do?" Foster was approached by a friend who worked in a theatre in the West End of London during casting for the musical Oliver!. Foster replied, "I've got the kid." Jones was cast and appeared to great acclaim as the Artful Dodger. He played the role in London and then on Broadway and was nominated for a Tony Award. On 9 February 1964, he appeared on The Ed Sullivan Show with Georgia Brown who was playing Nancy in the Broadway production of Oliver!. This was the same episode of the show in which the Beatles made their first appearance. Jones said of that night, "I watched the Beatles from the side of the stage, I saw the girls going crazy, and I said to myself, this is it, I want a piece of that." Following his Ed Sullivan appearance, Jones signed a contract with Ward Sylvester of Screen Gems (then the television division of Columbia Pictures). A pair of American television appearances followed, as Jones received screen time in episodes of Ben Casey and The Farmer's Daughter. Jones debuted on the Billboard Hot 100 in the week of 14 August 1965, with the single "What Are We Going To Do?" The 19-year-old singer was signed to Colpix Records, a label owned by Columbia. His debut album David Jones, on the same label, followed soon after (CP493). In 1967 the album was issued in the UK, in mono only, on the Pye Records label (NPL 18178). From 1966 to 1971, Jones was a member of the Monkees, a pop-rock group formed expressly for a television show of the same name. With Screen Gems producing the series, Jones was shortlisted for auditions, as he was the only Monkee who was signed to a deal with the studio, but still had to meet producers Bob Rafelson's and Bert Schneider's standards. Jones sang lead vocals on many of the Monkees' recordings, including "I Wanna Be Free" and "Daydream Believer". The NBC television series the Monkees was popular, and remained in syndication. After the group disbanded in 1971, Jones reunited with Micky Dolenz as well as Monkees songwriters Tommy Boyce and Bobby Hart in 1974 as a short-lived group called Dolenz, Jones, Boyce & Hart. A Monkees television show marathon ("Pleasant Valley Sunday") broadcast on 23 February 1986 by MTV resulted in a wave of Monkeemania not seen since the group's heyday. Jones reunited with Dolenz and Peter Tork from 1986 to 1989 to celebrate the band's renewed success and promote the 20th anniversary of the group. A new top 20 hit, "That Was Then, This Is Now" was released (though Jones did not perform on the song) as well as an album, Pool It!. Monkees activity ceased until 1996 when Jones reunited with Dolenz, Tork and Michael Nesmith to celebrate the 30th anniversary of the band. The group released a new album entitled Justus, the first album since 1967's Headquarters that featured the band members performing all instrumental duties. It was the last time all four Monkees performed together. In February 2011, Jones confirmed rumours of another Monkees reunion. "There's even talk of putting the Monkees back together again in the next year or so for a U.S. and UK tour," he told Disney's Backstage Pass newsletter. "You're always hearing all those great songs on the radio, in commercials, movies, almost everywhere." The tour (Jones's last) came to fruition entitled, An Evening with The Monkees: The 45th Anniversary Tour. In 1967, Jones opened his first store, called Zilch, at 217 Thompson Street in the Greenwich Village section of New York City. The store sold "hip" clothing and accessories and also allowed customers to design their own clothes. After the Monkees officially disbanded in 1971, Jones kept himself busy by establishing a New York City-style street market in Los Angeles, called "The Street" which cost approximately $40,000. He also collaborated with musical director Doug Trevor on a one-hour ABC television special entitled Pop Goes Davy Jones, which featured new artists The Jackson 5 and the Osmonds. Bell Records, then having a string of hits with The Partridge Family, signed Jones to a somewhat inflexible solo record contract in 1971. Jones was not allowed to choose his songs or producer, resulting in several lackluster and aimless records. His second solo album, Davy Jones (1971) was notable for the song "Rainy Jane", which reached No.52 in the Billboard charts. 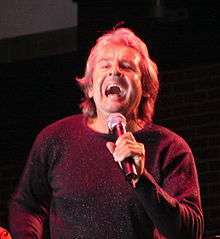 To promote the album, Jones performed "Girl" on an episode of The Brady Bunch entitled "Getting Davy Jones". Although the single sold poorly, the popularity of Jones's appearance on the show resulted in "Girl" becoming his best-remembered solo hit, even though it was not included in the album. The final single, "I'll Believe In You"/"Road to Love," was poorly received. Jones with Maureen McCormick in the 1971 The Brady Bunch episode "Getting Davy Jones", in which he was a guest star. Jones also continued acting after the Monkees, either as himself or another character. He appeared in two episodes each of Love, American Style and My Two Dads. Jones also appeared in animated form as himself in 1972 in an hour-long episode of The New Scooby-Doo Movies. Other television appearances include Sledge Hammer!, Boy Meets World, Hey Arnold!, The Single Guy (where he is mistaken for Dudley Moore) and Sabrina, the Teenage Witch in which he sang "Daydream Believer" to Sabrina (Melissa Joan Hart) as well as (I'll) Love You Forever. In 2009, Jones made a cameo appearance as himself in the SpongeBob SquarePants episode "SpongeBob SquarePants vs. The Big One" (his appearance was meant to be a pun on Davy Jones' Locker). Jones also returned to theatre several times after the Monkees. He appeared in several productions of Oliver! as the Artful Dodger, and in 1989 toured the US portraying Fagin. Jones also co-starred with Micky Dolenz in Harry Nilsson's play The Point at the Mermaid Theatre, London in 1978. Despite his initial high profile after the end of the Monkees, Jones struggled to establish himself as a solo artist. Glenn A. Baker, author of Monkeemania: The True Story of the Monkees, commented in 1986 that "for an artist as versatile and confident as (Davy) Jones, the relative failure of his post-Monkees activities is puzzling. For all his cocky predictions to the press about his future plans, Davy fell into a directionless heap when left to his own devices." The continued popularity of his 1971 Brady Bunch appearance led to his being cast as himself in The Brady Bunch Movie. Jones sang his signature solo hit "Girl", with a grunge band providing backing, this time with middle-aged women swooning over him. Micky Dolenz and Peter Tork also appeared alongside Jones as judges. On 21 June 1997, during a concert at the Los Angeles Coliseum, Jones joined U2's The Edge onstage for a karaoke performance of "Daydream Believer," which had become a fixture of the band's set during that year's PopMart Tour. In 2001, Jones released Just Me, an album of his own songs, some written for the album and others originally on Monkees releases. In the early 2000s he was performing in the Flower Power Concert Series during Epcot's Flower and Garden Festival, a yearly gig he would continue until his death. In April 2006, Jones recorded the single "Your Personal Penguin", written by children's author Sandra Boynton, as a companion piece to her new board book of the same title. On 1 November 2007, the Boynton book and CD titled Blue Moo was released and Jones is featured in both the book and CD, singing "Your Personal Penguin". In 2009, Jones released a collection of classics and standards from the 1940s through the 1970s entitled She. In December 2008, Yahoo! Music named Jones the "Number 1 teen idol of all time". In 2009, Jones was rated second in a list of 10 best teen idols compiled by Fox News Channel. In 2009, Jones had a cameo role as himself in an episode of SpongeBob SquarePants, titled "SpongeBob SquarePants vs. The Big One". Jones was married three times. In December 1968, he married Dixie Linda Haines, with whom he had been living. Their relationship had been kept out of the public eye until after the birth of their first child in October 1968. It caused a considerable backlash for Jones from his fans when it was finally made public. Jones later stated in Tiger Beat magazine, "I kept my marriage a secret because I believe stars should be allowed a private life." Jones and Haines had two daughters: Talia Elizabeth (born 2 October 1968) and Sarah Lee (born 3 July 1971). The marriage ended in 1975. Jones married his second wife Anita Pollinger on 24 January 1981, and also had two daughters with her – Jessica Lillian (born 4 September 1981) and Annabel Charlotte (born 26 June 1988). They divorced in 1996 during the Monkees' 30th Anniversary reunion tour. Jones married for a third time on 30 August 2009 to Jessica Pacheco, 32 years his junior. This was Pacheco's third marriage as well. On 28 July 2011, Pacheco filed to divorce Jones in Miami-Dade County, Florida, but dropped the suit in October. They were still married when he died in February 2012. Pacheco was omitted from Jones' will, which he made before their marriage. His oldest daughter Talia, whom he named his executor, was granted by the court the unusual request that her father's will be sealed, on the basis that "planning documents and financial affairs as public opinion could have a material effect on his copyrights, royalties and ongoing goodwill." In addition to his career as an entertainer, Jones' other first love was horses. Training as a jockey in his teens, Jones later said, "I made one huge mistake. When the Monkees finished in 1969–70, I should have got away from Hollywood and got back into the racing game. Instead I waited another 10 years. Everyone makes mistakes in life and for me that was the biggest." He held an amateur rider's licence and rode in his first race at Newbury in Berkshire, England for trainer Toby Balding. On 1 February 1996, he won his first race, on Digpast, in the one-mile Ontario Amateur Riders Handicap at Lingfield in Surrey, England. Jones also had horse ownership interests in both the US and the UK, and served as a commercial spokesman for Colonial Downs racetrack in Virginia. In tribute to Jones, Lingfield Park announced that the first two races on the card for 3 March 2012 would be renamed the "Hey Hey We're The Monkees Handicap" and the "In Memory of Davy Jones Selling Stakes" with successful horses in those races accompanied into the Winners' Enclosure by some of the Monkees' biggest hits. Plans were also announced to erect a plaque to commemorate Jones next to a Monkey Puzzle tree on the course. On the morning of 29 February 2012, Jones went to tend his fourteen horses at a farm in Indiantown, Florida. After riding one of his favourite horses around the track, he complained of chest pains and difficulty breathing and was rushed to Martin Memorial South Hospital in Stuart, Florida, where he was pronounced dead of a severe heart attack resulting from arteriosclerosis. On Wednesday, 7 March 2012, a private funeral service was held at Holy Cross Catholic parish in Indiantown, Florida. The three surviving Monkees did not attend in order not to draw more attention to the grieving family. Instead, the group attended memorial services in New York City as well as organising their own private memorial in Los Angeles along with Jones's family and close friends. Additionally, a public memorial service was held on 10 March 2012 in Beavertown, Pennsylvania, near a church Jones had purchased for future renovation. On Monday 12 March, a private memorial service was held in Openshaw, Manchester at Lees Street Congregational Church where Jones performed as a child in church plays. Jones' wife and daughters travelled to England to join his relatives based there for the service, and placed his ashes on his parents' graves for a time. "For me, David was the Monkees. They were his band. We were his side men." The news of Jones' death triggered a surge of Internet traffic, causing sales of the Monkees' music to increase dramatically. Guitarist Michael Nesmith stated that Jones's "spirit and soul live well in my heart, among all the lovely people, who remember with me the good times, and the healing times, that were created for so many, including us. I have fond memories. I wish him safe travels." In an 8 March 2012 interview with Rolling Stone magazine, Nesmith commented, "For me, David was the Monkees. They were his band. We were his side men." Bassist Peter Tork said, "Adios to the Manchester Cowboy", and speaking to CNN, drummer/singer Micky Dolenz said, "He was the brother I never had and this leaves a gigantic hole in my heart". Dolenz claimed that he knew something bad was about to happen and said "Can't believe it.. Still in shock.. had bad dreams all night long." Dolenz was gratified by the public affection expressed for both Jones and the Monkees in the wake of his bandmate's death. "He was a very well-known and well-loved character and person. There are a lot of people who are grieving pretty hard. The Monkees obviously had a following, and so did (Jones) on his own. So I'm not surprised, but I was flattered and honored to be considered one of his friends and a cohort in Monkee business." Monkees co-creator Bob Rafelson commented that Jones "deserves a lot of credit, let me tell you. He may not have lived as long as we wanted him to, but he survived about seven lifetimes, including being perhaps the biggest rock star of his time." Brady Bunch co-star Maureen McCormick commented that "Davy was a beautiful soul." She says that he "spread love and goodness around the world. He filled our lives with happiness, music, and joy. He will live on in our hearts forever. May he rest in peace." Yahoo! Music commented that Jones's death "hit so many people so hard" because "Monkees nostalgia cuts across generations: from the people who discovered the band during their original 1960s run; to the kids who came of age watching 1970s reruns; to the twenty- and thirtysomethings who discovered the Monkees when MTV (a network that owes much to the Monkees' influence) began airing old episodes in 1986." 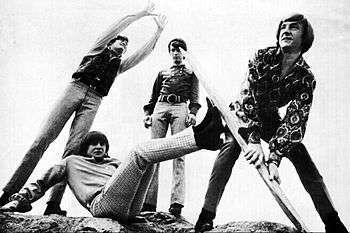 Time magazine contributor James Poniewozik praised the Monkees' classic sitcom, and Jones in particular, saying "even if the show never meant to be more than entertainment and a hit-single generator, we shouldn’t sell The Monkees short. It was far better television than it had to be; during an era of formulaic domestic sitcoms and wacky comedies, it was a stylistically ambitious show, with a distinctive visual style, absurdist sense of humour and unusual story structure. Whatever Jones and the Monkees were meant to be, they became creative artists in their own right, and Jones's chipper Brit-pop presence was a big reason they were able to produce work that was commercial, wholesome and yet impressively weird." Mediaite columnist Paul Levinson noted that "The Monkees were the first example of something created in a medium – in this case, a rock group on television – that jumped off the screen to have big impact in the real world." 2007 Sexina Singer Alternative title: Sexina: Popstar P.I. 1960 BBC Sunday-Night Play Episode: "Summer Theatre: June Evening"
1964 Ben Casey Gregg Carter Episode: "If You Play Your Cards Right, You Too Can Be a Loser"
1966 The Farmer's Daughter Roland Episode: "Moe Hill and the Mountains"
1970 Make Room for Granddaddy Himself Episode: "The Teen Idol"
1971 The Brady Bunch Davy Jones Episode: "Getting Davy Jones"
1972 The New Scooby-Doo Movies Himself (Voice) Episode: "The Haunted Horseman in Hagglethorn Hall"
1977 The Wonderful World of Disney Davey Sanders Episode: "The Bluegrass Special"
1986 New Love, American Style Episode: "Love-a-Gram/Love and the Apartment"
1988 Sledge Hammer! Jerry Vicuna Episode: "Sledge, Rattle 'n' Roll"
1991 ABC Afterschool Special Albert Lynch Episode: "It's Only Rock & Roll"
1991 Trainer Steve Moorcroft Episode: "No Way to Treat a Lady"
1992 Herman's Head Himself Episode: "The One Where They Go on the Love Boat"
1995 Boy Meets World Reginald Fairfield Episode: "Rave On"
1996 Lush Life Johnny James Episode: "The Not So Lush Rock Star"
1996 The Single Guy Himself Episode: "Davy Jones"
1997 Sabrina, the Teenage Witch Himself Episode: "Dante's Inferno"
2002 Hey Arnold! Himself (Voice) Episode: "Gerald's Game/Fishing Trip"
2009 SpongeBob SquarePants Himself Episode: "SpongeBob SquarePants vs. The Big One"
2011 Phineas and Ferb Nigel (voice) Episode: "Bad Hair Day/Meatloaf Surprise"
1965 Colpix CP-493 (mono) / Colpix SCP-493 (stereo) David Jones 185 73 (US) Credited as "David Jones"
1967 Pye NPL 18178 (mono) David Jones – – (UK) Credited as "David Jones"
January 1978 MCA MCF2826 The Point – – Jones sings most of the songs on this original cast recording of Harry Nilsson's stage performance of "The Point!". Album was initially released in Britain only, followed by a release in Japan. June 1981 Japan JAL-1003 Davy Jones Live – – Released in Japan only. March 1982 Pioneer K-10025 Hello Davy (Davy Jones Live) – – Released in Japan only. According to some sources, this is an unauthorised LP release, with the audio having been lifted from the Japanese-released LaserDisc of this concert. February 1965 Colpix 764 "Dream Girl"
July 1965 Colpix 784 "What Are We Going To Do?" b/w "This Bouquet" 93 94 88 Credited as "Mr. David Jones"
October 1965 Colpix 793 "The Girl From Chelsea"
1967 Pye 17302 "It Ain't Me Babe"
May 1971 Bell 986 "Do It In The Name Of Love"
June 1971 Bell 45111 "Rainy Jane"
October 1971 Bell 45136 "I Really Love You"
November 1971 Bell 45159 "Girl"
January 1972 Bell 45178 "I'll Believe In You"
1972 MGM 14458 "Who Was It?" b/w "You're A Lady" – – – Jones sang "You're A Lady" in Japanese on a Japan MGM 45 in 1972.
b/w "Rubberene" – – – This single was released as a promotional copy only. May 1978 Warner Brothers 17161 "(Hey Ra Ra Ra) Happy Birthday Mickey Mouse"
May 1981 Japan 2007 "It's Now"
June 1981 Japan 2010 "Dance Gypsy"
b/w "Can She Do It (Like She Dances)" – – – Released in Japan only. March 1982 Pioneer 1517 "Sixteen (Baby, You'll Soon Be Sixteen)"
b/w "Baby Holdout" – – – Released in Japan only. December 1984 JJ 2001 "I'll Love You Forever"
1987 Powderworks 374 "After Your Heart"
b/w "Hippy Hippy Shake" – – – Released in Australia only. A-side recorded in October 1981; B-side recorded in 1987. They Made a Monkee Out of Me, autobiography (print book) by Davy Jones, Dome PR, 1987, ISBN 978-0-9618614-0-7. They Made a Monkee Out of Me: Davy Jones Reads His Autobiography, (audiobook), Dove Entertainment Inc (November 1988). 1 2 O'Connor, Rob (1 December 2008). "Yahoo Music: The Top 25 Teen Idols Of All-Time". New.music.yahoo.com. Retrieved 2 March 2012. 1 2 Kaufman, Gil. "Monkee Davy Jones Paved Way For Heartthrobs Like Justin Bieber". Mtv. Retrieved 2 March 2012. ↑ "Davy Jones in Corrie". ITV. 1 March 2012. Retrieved 16 February 2013. 1 2 "Davy Jones Biography – Facts, Birthday, Life Story". Biography.com. 30 December 1945. Retrieved 31 December 2011. ↑ "Davy Jones 1945–2012: Farewell to a Teen Idol". People. New York: Time Warner: 68–72, 75. 19 March 2012. ↑ Milham, Simon (2012-02-17). "The Monkees frontman Davy Jones repaying Newmarket trainer for setting him on road to stardom | Mail Online". Dailymail.co.uk. Retrieved 2014-05-24. ↑ "Davy Jones". London: Telegraph. 29 February 2012. Retrieved 4 March 2012. ↑ "Davy Jones Bio". davyjones.net. ↑ Fox, Margalit (29 February 2012). "Davy Jones, Monkees Singer, Dies at 66". New York Times. Retrieved 1 March 2012. ↑ "Davy Jones and the Monkees' Billboard Chart Legacy | Billboard". Billboard.biz. Retrieved 2014-05-24. ↑ "David Jones* - David Jones (Vinyl, Album, Album) at Discogs". Discogs.com. Retrieved 2014-05-24. ↑ "Davy Jones - Davy Jones (Vinyl, LP, Album) at Discogs". Discogs.com. Retrieved 2014-05-24. 1 2 3 4 5 6 7 8 9 10 Lefcowitz, Eric (2011). Monkee Business: The Revolutionary Made-For-TV Band. Port Washington, New York: Retrofuture Products, LLC. ISBN 0-943249-00-7. ↑ "Disney's Backstage Pass Feb. 2001". Disneyworld.disney.go.com. Retrieved 2 March 2012. ↑ "Monkees announce 10-date concert tour". United Press International. 21 February 2011. Retrieved 26 May 2011. 1 2 3 4 5 6 7 8 9 10 11 Baker, Glenn A.; Tom Czarnota; Peter Hoga (1986). Monkeemania: The True Story of the Monkees. New York City: Plexus Publishing. pp. 87, 117. ISBN 0-312-00003-0. ↑ Aaron Badgley. "Just Me - Davy Jones | Songs, Reviews, Credits, Awards". AllMusic. Retrieved 2014-05-24. ↑ "Davy Jones Solo – April 19, 2002 – EPCOT's Flower Power Festival". Monkeesrule43.com. 19 April 2002. Retrieved 4 March 2012. ↑ "2014 Epcot Flower and Garden Festival, Flower Garden Epcot". Wdwinfo.com. Retrieved 2014-05-24. ↑ "MP3 of the song Personal Penguin". Retrieved 2 March 2012. ↑ "Workman Publishing author site for Sandra Boynton". Workman.com. Retrieved 2 March 2012. ↑ "Then & Now: 10 Best Teen Idols of All Time". Fox News. 30 November 2011. Retrieved 2 March 2012. 1 2 "Davy Jones biography – spouse information". IMDb.com. Retrieved 2014-05-24. ↑ "Monkey Business Surrounding Davy Jones Estate". Forbes. Retrieved 2014-05-24. 1 2 Milham, Simon (17 February 2012). "How a racing-mad Monkee is repaying a debt of gratitude to a retired Newmarket trainer". Dail Mail. London. Retrieved 1 March 2012. ↑ "Welcome to the National HBPA". Hbpa.org. Retrieved 2 March 2012. ↑ "Saturday 3rd March Afternoon Racing". lingfield-racecourse.co.uk. Retrieved 2 March 2012. ↑ "Davy Jones' Death Caused By Severe Heart Attack". idolator.com. 2 March 2012. Retrieved 2 March 2012. ↑ "Davy Jones, lead singer of the Monkees, dies in Indiantown, according to medical examiner's office". WPTV. 29 February 2012. Archived from the original on 2 March 2012. Retrieved 29 February 2012. ↑ "Davy Jones of The Monkees dies aged 66". BBC News. 1 March 2012. Retrieved 1 March 2012. ↑ Sedensky, Matt (8 March 2012). "Monkees star Davy Jones mourned in private funeral". Yahoo News. Associated Press. ↑ "Micky Dolenz: Monkees to skip Davy Jones' funeral, pay tribute to him at public memorials". The Washington Post. 6 March 2012. Retrieved 6 March 2012. 1 2 Youngs, Ian (2012-03-12). "BBC News - Davy Jones: Family bid final farewell in Manchester". Bbc.co.uk. Retrieved 24 May 2014. 1 2 "Exclusive: Michael Nesmith Remembers Davy Jones". Rolling Stone. 8 March 2012. Retrieved 9 March 2012. ↑ "The Monkees' sales soar following Davy Jones' death". HitFix.com. Retrieved 9 March 2012. ↑ ""Micky Dolenz – I Knew Something Was Wrong" at". Tmz.com. Retrieved 2 March 2012. ↑ "Davy Jones Funeral: Surviving Monkees May Not Attend". Billboard. Retrieved 5 March 2012. 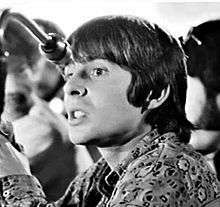 ↑ "'Davy Jones deserves a lot of credit' - Monkees co-creator Bob Rafelson". Los Angeles Times. 1 March 2012. Retrieved 5 March 2012. ↑ Everett, Cristina (1 March 2012). "Davy Jones dead: Maureen McCormick pays tribute to late Monkees singer, says he was 'a beautiful soul'". Daily News (New York). Retrieved 1 March 2012. ↑ Parker, Lyndsey (February 2012). "Shades Of Grey: Sadly Remembering Davy Jones's Musical Legacy". Stop The Presses!. Retrieved 1 March 2012. ↑ Poniewozik, James (February 2012). "RIP Davy Jones, The Monkees' Daydreamboat". Time (magazine). Retrieved 29 February 2012. ↑ Levinson, Paul (February 2012). "Why The Monkees Are Important". Mediaite. Retrieved 2 March 2012. ↑ "Who Is David Jones?". Billboard. 20 February 1965. Retrieved 1 March 2012. ↑ "Colpix presents David Jones". Billboard. 17 July 1965. Retrieved 1 March 2012. Wikimedia Commons has media related to Davy Jones (musician).